The exhibition shows the artists’ interpretations of the simple brief ‘map your space’, their work mounted on tarnished white walls marked by pencil doodles and minor vandalism. Mike Ballard, The Ultra Poet, 2014. 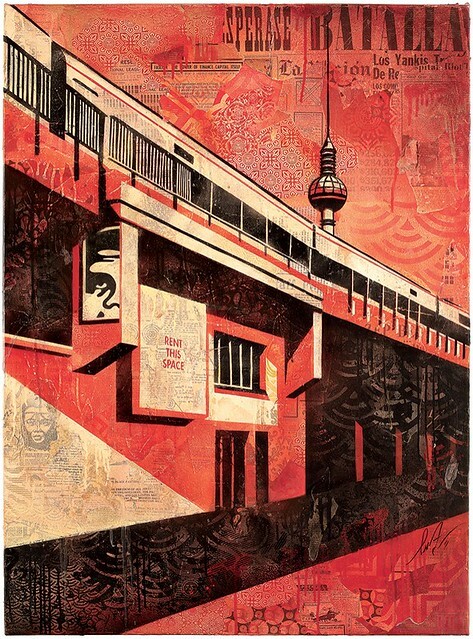 Shepard Fairey, Berlin Tower, 2011. 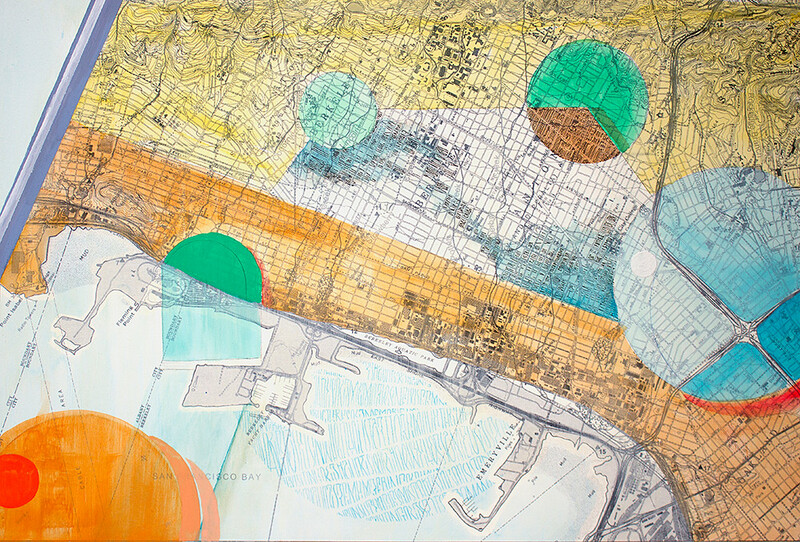 The ‘cartographic art by international street and graffiti artists’ materialises as metaphorical, psychogeographic, gestural and intricately fantastical renderings of cities. 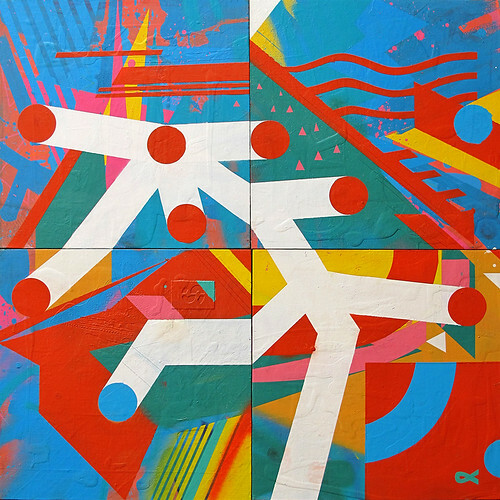 Cities such as Paris, Bangkok and Los Angeles are interpreted in a range of media – from found materials, cement, latex, nylon and mylar, to more the expected spray paint, ink and pencil. The mesmerising A2 map-like exhibition programme, designed by Savvy Studio in Mexico, uses colourful arrows to link the cartographic works by theme and medium and leaves the eye to dart around the page searching for the work in front of you. 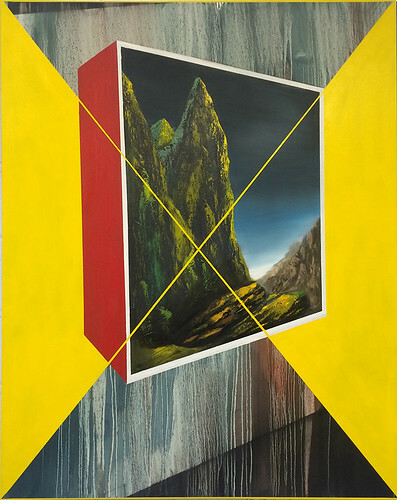 Augustine Kofie, Overcast Angeles, 2014. Key works on display include Jeroen ‘Erosie’ Heeman’s Untitled (cycling), 2014, a mixed-media collage based on cycling routes around Berlin, Moscow, Rotterdam and elsewhere; Graphic Surgery’s Amsterdam, 2014, a laser-engraved piece made from reclaimed wood; and MOMO’s Tag Manhattan, 2013 and 2006, a giclee print and performative video installation documenting the creation of the world’s longest tag that stretched eight miles across Manhattan. 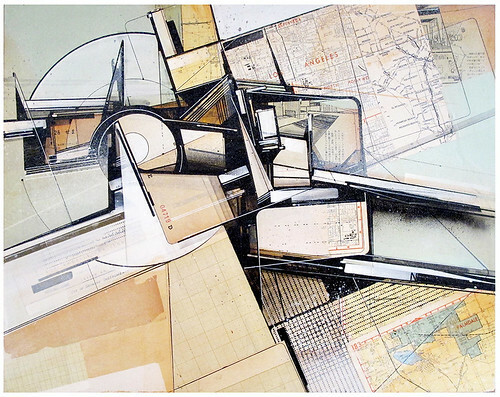 Other familiar names in the show include Shepard Fairey, Boris Tellegen and Swoon. 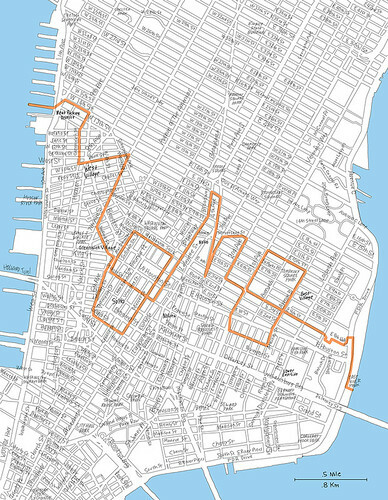 MOMO’s giclee print Tag Manhattan, 2013 documenting the path of the world’s longest tag created in 2006. 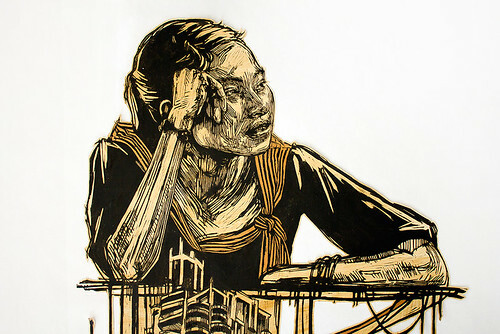 Detail from Swoon’s Bangkok, 2009-2012. 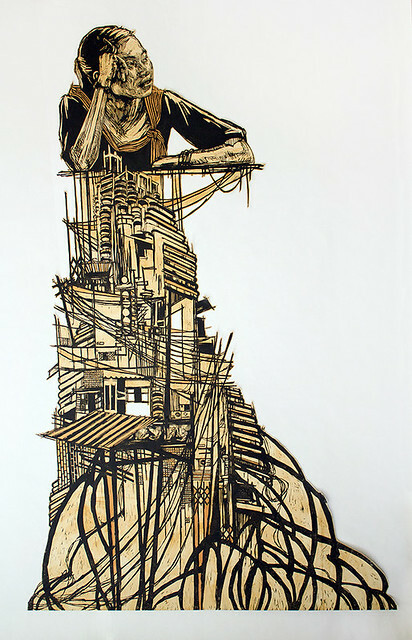 Swoon, Bangkok, 2009-2012, a block print on mylar, coffee stained and hand painted. The exhibition was curated by A (by) P (Approved by Pablo) in conjunction with Somerset House. University College London’s Anthropology department is hosting complementary events including this weekend’s ‘Mapping Through Making’ family workshop (7 February) and ‘Mapping Through Film: An Evening with Marc Isaacs’ on 12 February. ‘Mapping the City’ continues until 15 February 2015. Chu (Julian Pablo Manzelli), Buenos Aires, 2012.